Heat oven to 350°F. Spray large cookie sheet with cooking spray, or line with cooking parchment paper. In large bowl, stir milk and egg white until blended. Stir in muffin mix and 1/2 cup oats (dough will be sticky). On cookie sheet, shape dough into 8-inch round, about 1/2 inch thick, using floured fingers. 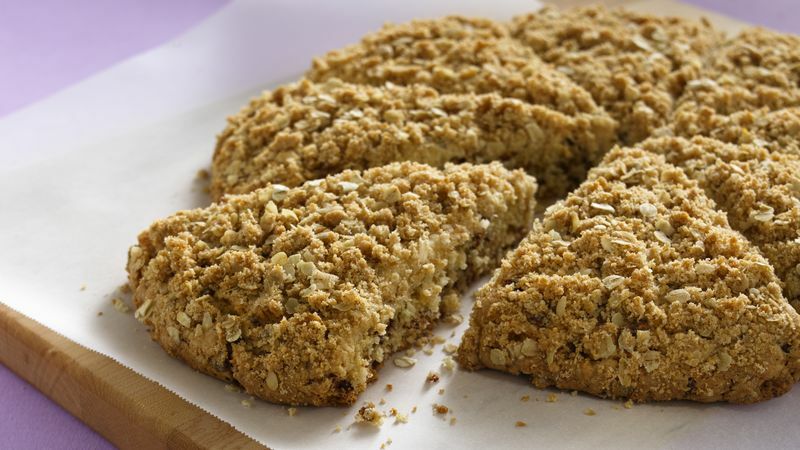 Break up any lumps in streusel (from muffin mix); mix streusel and 2 tablespoons oats. Sprinkle streusel mixture over dough. Cut dough into 8 wedges; separate wedges slightly. Bake 25 to 35 minutes or until golden brown. Serve warm. Add some variety to your scones. Stir in 1/2 cup raisins, dried cranberries, chocolate chips or chopped nuts.